We recognise digitisation as an important topic for the financial services industry; for this reason, we have developed a content programme with the Economist Intelligence Unit that focuses on how Financial Services companies are adapting their risk and reporting procedures to the new digital environment. This unique programme of thought leadership examines the new challenges in the digital finance environment through the context of ethics and compliance. Financial services has always been an information-based industry. But trends in technology have been reshaping the finance, insurance and real estate (FIRE) sector. From data analytics to mobile payments, in many ways, financial services have been transformed over the last several years. Adding to that the wave of re-regulation in the wake of the financial crisis, compliance has been positioned as a decisive factor too vital to be neglected. As financial services companies aim to rebuild the trust of both regulators and clients, these measures must ensure that business operations are both legal and ethical; a higher bar than many used to set. Our report considers how financial services companies are responding to both the wave of regulations and the surge in digitisation. 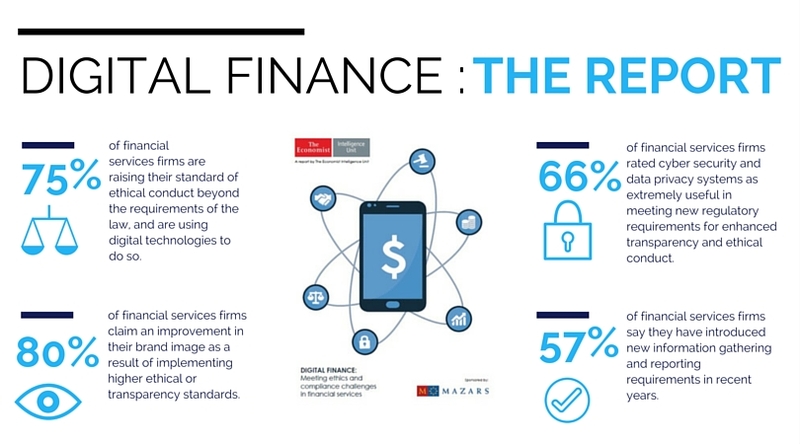 It considers how adopting specialised digital technologies might help financial companies to improve their services, manage risks better, raise their standards of transparency and build trust. The report is based on a combination of desk research, an online survey of 200 financial services companies worldwide, and in-depth interviews with six experts in the topic under study. Please download the full report here to find out more.